Glad to know you are reading this right now. I am sure you really want to know types of nouns with examples. We cannot talk about types of nouns if we do not first talk about the concept of a noun itself. I have put together a post on what a noun is. It would be great if you can look up the post. 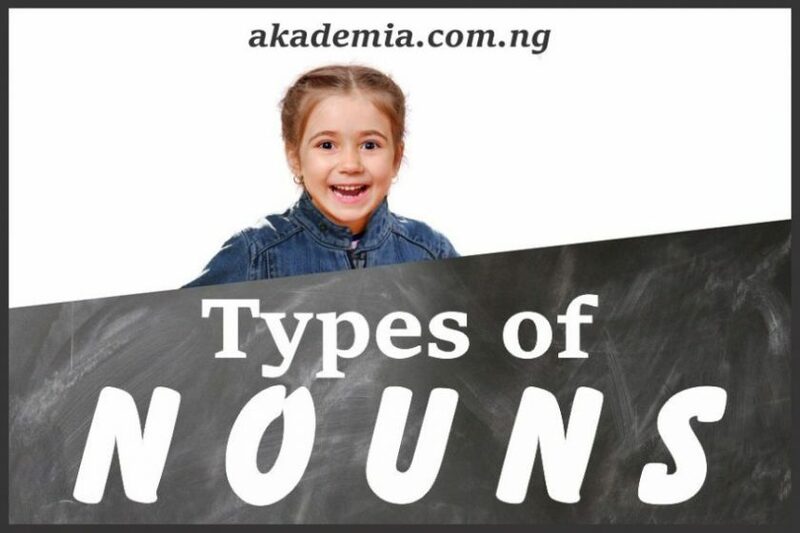 But here, we discuss the different types of nouns that we have in the English language. These can be found personal names, with or without a title such as President Buhari, George, Mr. Bala, Pastor Alfred, Dr. Sally, etc. They also include globally recognised holidays, festivals, calendar items like Halloween, Thanksgiving, Independence Day, Argungu Festival, Osun Osogbo Festival, Good Friday, Christmas, Easter, etc. Days of the week, months of the year are all proper nouns. Television outfits/stations (British Broadcasting Corporation-BBC, Cable Network News-CNN, Fox News, Al-Jazeera, Channels Television, etc. They could also be post-modified e. g.
Proper nouns can be combined sometimes with common nouns, and when this happens the resulting expression is taken as a proper noun. Examples: Trafalgar Square, Eagle Square, Stanford Bridge, Trans Amusement Park, etc. Their initial letters are usually capitalised. Though with exceptions, proper nouns usually do not admit articles. The usually do not admit the plural form except when used in a special sense, e. g. the Adebumitis will visit today. Common nouns are general nouns. In other words, they are common as the name goes. They are not names like proper nouns but they can be a label. For instance, ‘boy’ is a common noun which denotes a label used for a young male. Proper nouns, when they do not refer to a specific entity, can also be changed into common nouns. Examples include: girl, baby, house, road, paper, sea, river, ocean, city, town, state, villa, pavilion, roof, street, close, quarters, etc. Common nouns are not usually capitalised like proper nouns except they begin a sentence. Common nouns further subdivide into Count (Countable) Nouns and Non-Count (Uncountable) Nouns. These are nouns that we can count easily and have the countability nature. We can pluralise them and they can accommodate articles ‘a’ or ‘an’ before them. When you think of anything that you can count, it is most likely a count noun. Examples include: boy, child, girl, pen, pencil, book, television, car, bicycle, phones, cups, lorry, tanker, chair, table, baby, woman, man, father, mother, sister, mouse, animal, bird, insect, dog, etc. These are nouns that we cannot count or we usually do not count. Examples of these nouns are salt, water, sand, oil, cement, powder, etc. They cannot be pluralised either can they accommodate the articles ‘a’ or ‘an’ before them. However, we can count or pluralise them ONLY when we put them in measurable forms or when we consider them from the perspective of their containers. For example, we cannot count bread but when put in loaves, it becomes easier to count. So we can have five loaves of bread, seven tubers of yam, three gallons of oil, four sachets/bottles of water, three cups of garri, six bags of cement, one load of sand, four items of information, seven yards of cloth, etc. These are nouns that are palpable; we can see, feel, taste and touch them. They are mostly objects. Examples include: stone, wood, bread, laptop, chalk, book, table, chair, block, car, house, pole, rug, engine, tyre, broom, apple, fruits, guava, oranges, rice, bread, yam, etc. From the name, these nouns express abstract concepts, feelings, ideas, emotions, feelings. In other words, they are concepts that we cannot see, touch, handle or taste. Examples include: courage, bravery, importance, wisdom, beauty, honesty, integrity, success, failure, etc. However, in some cases, we can feel some abstract nouns like: hunger, anger, pain, relief, joy, sorrow, sadness, happiness, gladness, fear, etc. The team have departed the tournament (we see the ‘team’ as individual members and it takes a plural verb ‘have’). Writing can fetch you good money. The verbal nouns in the examples above all serve as the subjects of the sentences. However, they can perform all the functions of a noun: as an object (I love teaching), as a complement of the subject (A good sport is swimming), as a complement of the preposition (I voted in favour of reading), etc. The man’s car is old. My brother’s wife is generous. St. James’ School celebrates a decade of existence. We have submitted teachers’ lists. Nouns are important parts of speech and we need to know everything that has to do with them. Do share this post with your friends and get across to us on our Social Media Platforms. Thank you very much for this splendid explanation and diluting the english language to everyone’s understanding. Thanks for the explanation and the breaking down bit by bit. Wish to get more tutoring from you guys. I am so impressed at the way you guys broke this subject matter bit-by-bit to the understanding of any child that will like to have more knowledge of this subject matter thanks a lot. Wow! I’m so impressed. Thanks for supplying all the relevant information regarding the subject matter. Pretty! This has beеn a really wonderful article. Thank you for supplying these details.